$2.97 ($0.99 per day) for a 3-day temporary membership. $27.30 ($0.91 per day) for a 1-month membership. $45.90 ($0.51 per day) for an 3-month membership. $73.80 ($0.41 per day) for a 6-month membership. Dating: You can let members know you are interested in them “winking” at them… but you can only respond to a wink if you upgrade to a paying membership. Messages: You can send messages to other users, including “regular messages, flirtcasts, and promotion messages”… but only if you upgrade to a paying membership. Alerts: You can choose to receive alerts via your browser window… which inevitably steer you towards upgrading to a paying membership. 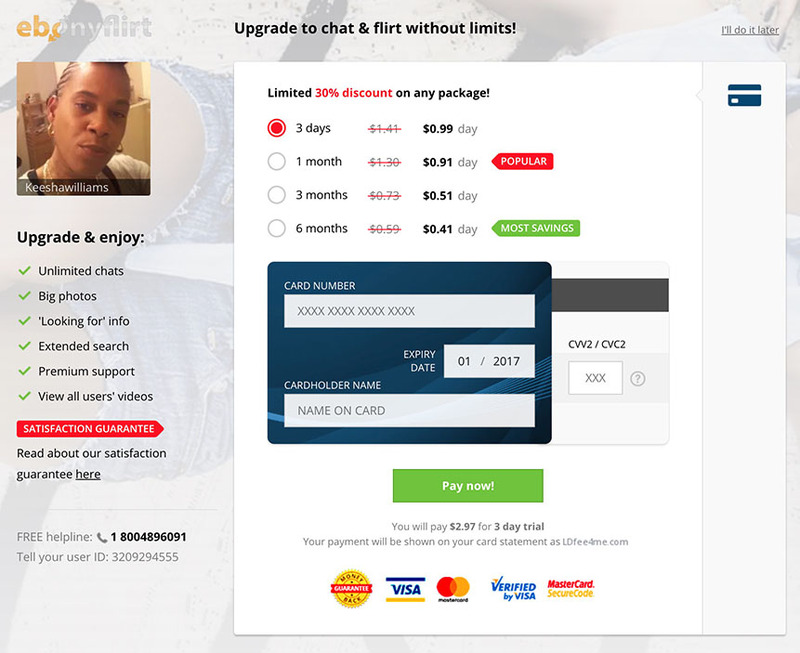 Upgrades: A premium membership to the site allows you to “enjoy unlimited chats, big photos, ‘looking for’ info, extended search, premium support, and view all users’ videos”. You also get their “Satisfaction Guarantee”, which is a whole other concern. 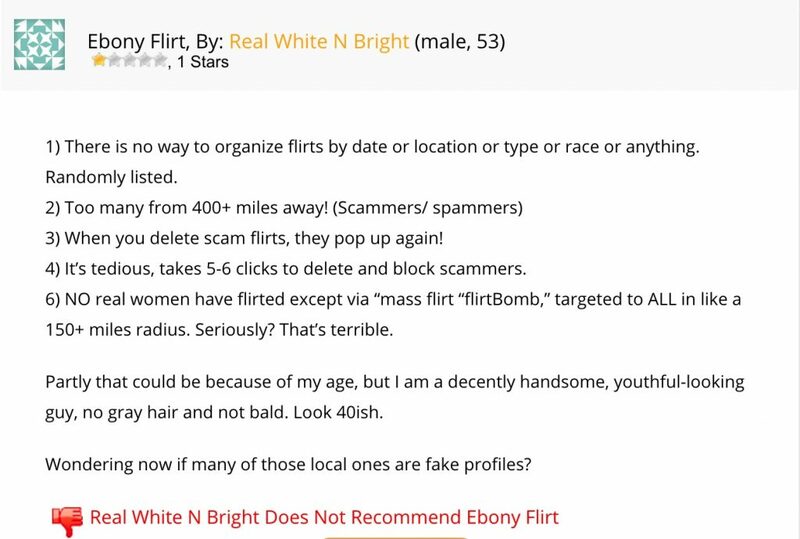 We investigated ebonyflirt.com to see whether they are in fact a legitimate online dating site. After spending some time on the site, it appears to be little more than bots and fake profiles. Everything we tried to do on the site was a funnel to upgrade to a paying membership. After registering for a free account using an email address and creating a username, messages started to pop up right away from local black women looking for companionship. Almost right away, our inbox started to fill up… with fake messages. So far, so good… until we tried typing a basic response to the chat message we received from “Keeshawilliams”. After trying to say “Hey, what’s up?”, we were then redirected to upgrade to a paying membership. Apparently, non-premium members can send five chat messages per day, but that’s only for chats you initiate, not ones you try and respond to, so it’s a pretty worthless feature. If you try to send a message to a user (which doesn’t seem to be any different than chatting with them), you are immediately asked for your credit card information before you can proceed. We tried “winking” at some members, and amazingly we could do so without upgrading to a paying membership. But considering the high probability that the overwhelming majority of profiles are fake, what does it matter? Winking at a fake profile isn’t going to get you anything more than a fake response. We were also able to “like” a profile, but there was no indication as to what that actually meant. We checked a few of the profile photos as best we could; without a paying membership, you only get pretty small thumbnails of faces. We ran a reverse image search on a couple and they did not appear to be copied from other sites or anywhere else online, but the image size is small (85 x 85 pixels). Are The Photos “Borrowed” From Other Sites? Ebonyflirt.com gets a decent mark here, as we couldn’t find the profile images anywhere else on the web, using a variety of sources. For the record, we never received any such email, but the idea itself is ridiculous. They don’t tell you who these “Partner Sites” are, so there is no way of knowing where your profile actually goes. Given the lengthy list of sites run by parent company Northlock Holdings, your info could turn up almost anywhere. We also apparently agreed to waive any right to join in a class action suit against the provider, which doesn’t even seem legal since the Terms of Service aren’t visible until after you agree to them. The most extraordinary scam on a website filled with scams is the so-called “Satisfaction Policy.” Paying members get the protection of the “Satisfaction Policy”, which says if you aren’t happy with the site, you don’t get your money back, but will give you a complimentary three-day membership to one of their mysterious “Partner Sites”, which then uses your original billing information to renew the subscription to THAT site at the end of the three-day trial period. So instead of offering you any kind of benefit for your dissatisfaction, they actually make the problem worse by signing you up for other sites without your consent. This vicious cycle could cost you a fortune. There is no indication that ebonyflirt.com is in any way a legitimate dating site. Every action is about getting you to sign up for a premium membership with no actual proof there are any real people at the end of the rainbow. Even the photos are so small, it’s difficult to really see what anyone looks like. Put all of that together and you see why it’s hard to imagine anyone connecting with a real person under any circumstances. Like similarly poor sites run by the same company such as maturesforfuck.com, the only thing anyone on this site wants in your pants is your credit card. If you feel you have been scammed by ebonyflirt.com or a similar site, make sure to file a report with the Better Business Bureau or the FBI Internet Crime Complaint Center. On a scale of 1-10, we give ebonyflirt.com a “2.2”. You may go to the site looking for booty, but you’re only going to find bots. BeNaughty.com – Is It Worth Your Time And Money? Noah Body on BeNaughty.com – Is It Worth Your Time And Money?